CyberLink PowerDirector is a video editing and video converting software application for non-linear video editing with is the competitor to Adobe Premiere Pro and Elements, Corel VideoStudio, Pinnacle Studio, Final Cut Express and Sony Vegas Movie Studio. CyberLink PowerDirectory allows users to capture, edit, produce, output video and create disc from within the software and has semi-professional features suitable for the consumer level in much similar way to Apple iMovie for Mac OS X.
CyberLink PowerDirector 7 has 2 editions available where the premium CyberLink PowerDirector 7 Ultra edition supports Blu-Ray Disc, AVCHD (for High Definition HD video) on DVD authoring, and Dolby 5.1 encoding, where the later also available for CyberLink PowerDirector 7 Deluxe. CyberLink PowerDirector version 7 supports up to 6 PiP tracks, features DirectorZone where users can download effects, templates and menus, and supports direct links to Flickr and Freesound. CyberLink PowerDirector 7 Ultra edition normally costs $99.95 for a single license purchase. 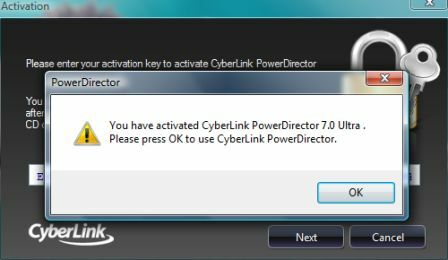 As CyberLink PowerDirector 8 has already been released, CyberLink is now having a promotion to giveaway free copy of CyberLink PowerDirector 7 Ultra with genuine legitimate activation serial key number together with SoftwareLoad.de. No crack, no torrent download, no keygen (key generator), warez serial number or activation key code is needed. Unfortunately there is no free upgrade to CyberLink PowerDirectory 8, but PowerDirector 7 license owner can upgrade at cheaper price. Fill in the required fields (those with * asterisk) such as title, first name, last name, email address, password, security question, security answer (if you don’t understand German, just pick anyone and type in any answer with at least 6 characters, just make sure you never forget the password! ), and the captcha code. Then, click on “Registrieren” button. A verification email will be sent to use’s mailbox. Click on the confirmation link in the email. Then, login to softwareload.de by using the register user name and password. For user who arrives at intermediary page with login details filled in, just click on “Anmeldung” button. Enter PCWPowerDirector as the “Gutschein-Code” (coupon code). A confirmation page will be displayed, stating that the “Reduzierter Preis” is now € 0,00, with “Sie sparen” of € 69,90. Click on “Weiter” button. User will be redirected to My Downloads page (“Meine Vollversionen”), where the license key, EOQNH-UUWKM-GYZYG-RAPUT-EP2SH-VG9P4 (everyone gets this same serial key), for activation will be shown, and then setup installer for CyberLink PowerDirector 7 Ultra can be downloaded. The installation file 56053_PowerDirector_7_Ultra.zip has the size of 617 MB, is the image of the retail version of PowerDirector 7 Ultra CD. So the trial version of CyberLink PowerDirector 7 Ultra does not accept this activation code. It will install CyberLink PhotoNow, CyberLink Power Director, Smartsound Quicktracks Plugin and/or Quicktime. Users can also download Audials One 3 SE, a limited trial version of Audials One 3 for free. Install CyberLink PowerDirector 7 Ultra, and use the free license serial number to register and activate the full version commercial software.